Wintertime is a particularly bleak time for me. I don’t prefer cold weather, but I do love it when I can get out in it. It is the only way for me to stay sane when I am tossed into the throes of winter and have to stay indoors. I admit to some mild seasonal depression, so cross country skiing in Colorado is a life-safer for my mental health. 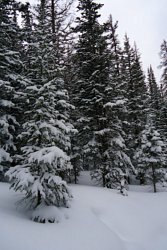 Nothing is more soothing to me, to lift my entire body, mind and soul as when I am in the great outdoors of Colorado, in the silence and quietude of a winter wonderland. 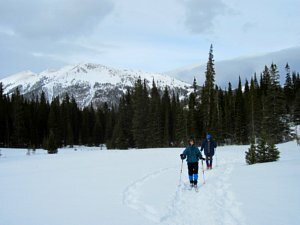 Deep in the heart of winter, I went on a mini, cross country ski vacation to the Colorado State Forest State Park in northern Colorado. 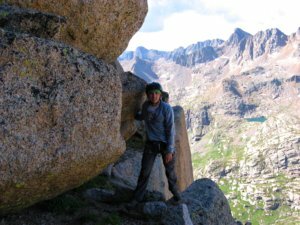 I went with my husband and another couple to the Never Summer Mountains area and specifically to the Nokhu Crags. In this area there is a system of huts, accessible in the wintertime only by cross country skiing or snow shoeing. The Native American word, "Nokhu" means Eagle’s Nest and you can easily see why! 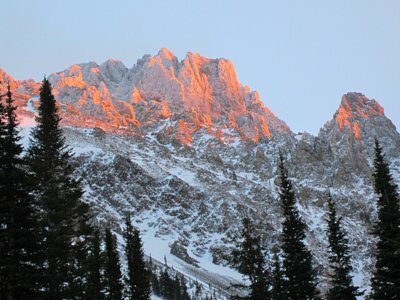 Nokhu Crags in the alpenglow at sunset as viewed from our hut. We geared up and skied in on that first day. 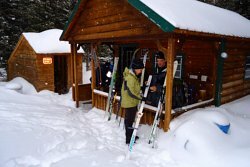 It was only about a two-mile cross country ski-in to the Nokhu hut where we would stay for two nights. However, due to the steepness of the road and our heavy backpacks, it took us about one-and-a-half hours. I was thrilled to be in this winter wonderland! The Nokhu Hut will house six adults, but since there were only four of us we were quite comfortable. It had a wood-burning stove where we melted the snow for our water, and a full set of kitchen utensils, with a little propane-powered cook top. The wood was chopped and available so we built a fire immediately upon our arrival. Elle and Rich skiing up the forest road. Since we had most of the afternoon left, we decided to take a quick ski around. The Nokhu Crags were on our left shoulders most of the way. They were breath taking as the pictures show. The freshly fallen snow had frosted them into frozen cathedral spires. 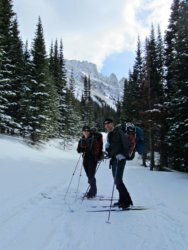 We skied around a little loop that we had created in the high meadow, with our friends Norm and Nadine. It was kick and glide, kick and glide ~ no skins needed. Rich and Elle at the Nokhu Hut. The rhythmic movements and the freedom of the great outdoors is always exhilarating for me! Cross country skiing has always been meditative for me, because of the rhythm of the movement. I glide into my whole self, with the movements of my physical body. I went to bed that night, wrapped in my down bag, snuggled next to my husband in the warm hut. I felt very content and at peace. I marveled at this, how just a short visit to the great outdoors, thus far could do so much for my morale! I made yet another mental note of the healing qualities of exertion in this winter wonderland that was so healing to my body-mind-soul! The next morning brought more delightful skiing as we geared up after a wonderful breakfast of French toast, Costa Rican coffee and sausage. 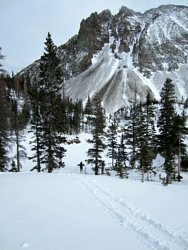 Our Colorado cross country skiing this morning consisted of climbing with our skins up very high into a ridge above a lake called Agnes. While the climb was quite grueling and my husband, Rich had some equipment problems, it was well worth the effort when we got there and saw this amazing panorama. These small pictures just really don't give it justice. The frosted, winter wonderland was breathtaking as you can see. It looks really cold in the pictures with all that expansive snow, but Colorado is a very dry cold, so with the exertion of the climb we were quite warm. I don't think I ever wore more than 3-4 layers the entire time. That is why skiing in Colorado is so amazing! Then we flew down the ridge into the lake basin itself, and onto the lake. It was hard to distinguish where the lake actually began! We cross country skied to our hearts content that second day. 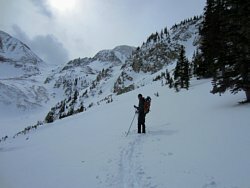 After returning from Lake Agnes, we skied more meadow loops. We ate and drank to our hearts content as well. The final morning we woke up to yet another blanket of freshly fallen snow. More winter wonderland! 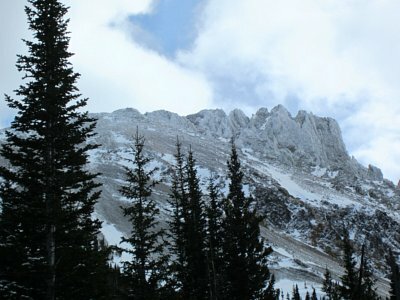 In fact it was still snowing when we geared up with our packs on our backs, to ski out. The skiing out was very fast, as it was all downhill. I tried not to ski too fast so I could marvel at the freshly covered trees. It was hard to slow down as once again the kick-glide, kick-glide carried me into this frozen cathedral of nature. 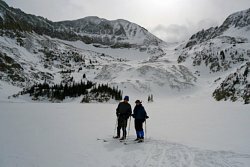 When cross country skiing in Colorado, it is almost always a climb up and a fast ski-down. 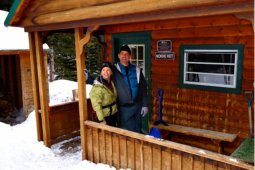 If you were considering a cross country skiing vacation in Colorado, I would definitely recommend the Never Summer Nordic huts and the Nokhu Crags. But book early as the places fill up fast, especially on the weekends. This winter wonderland was a perfect great outdoor experience to heal my body-mind-soul!